Greg Mindel of Neighbor Baker photographed at his pop-up in Sutton Cellars on Thursday, February 21, 2013 in Dogpatch, San Francisco, CA. 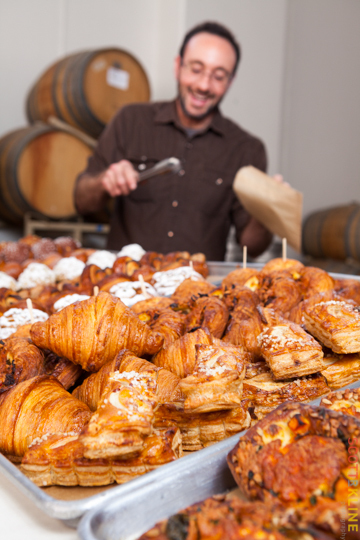 Loving thy neighbor is easy when it means choosing from trays of sweet and savory pastries at Neighbor bakery and when the neighbor is baker Greg Mindel. Although it isn't that easy choosing from among the more than ten different selections available early this morning at Mindel's Thursdays-only pop-up at 22nd and Illinois in the space normally occupied by winemaker Carl Sutton and his Sutton Cellars. 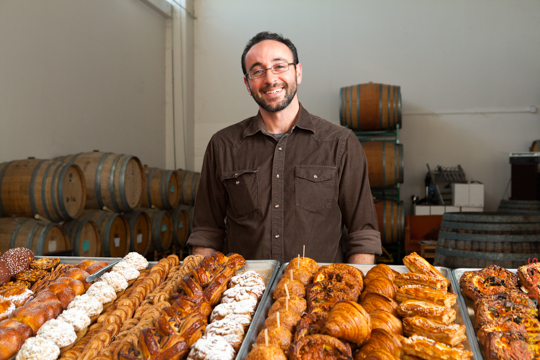 Mindel's traditional croissant has garnered him much deserved praise and press for perhaps offering the only "authentic" croissant in SF but it is hard to pass up the bacon kimchi green onion croissant or the passion fruit, cocoa and almond brioche. In the end we do indeed select the traditional croissant but also three (or four or five) of his other creations. We were thankful to have the treats to occupy us since a seemingly endless stream of customers came in as soon Mindel opened for business. In neighbor-like fashion, he seemed to know most of them -- shaking their hands and asking many of them if they wanted their usual or something new from the hand-written menu. 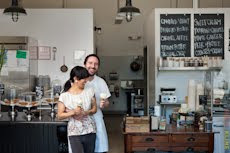 His genuine excitement at greeting each customer never flagged despite having baked all night as he does every night followed by early morning deliveries to such wholesale customers as Front Cafe, FourBarrel Coffee and SightGlass Coffee. Many of the customers were from nearby businesses -- even pastry rock star Michael Recchiuti lined up and filled a pastry box full of goodies to take to his co-workers. Although soft-spoken and modest, Mindel is exudes a quiet intensity when speaking about his plans for his year old business. 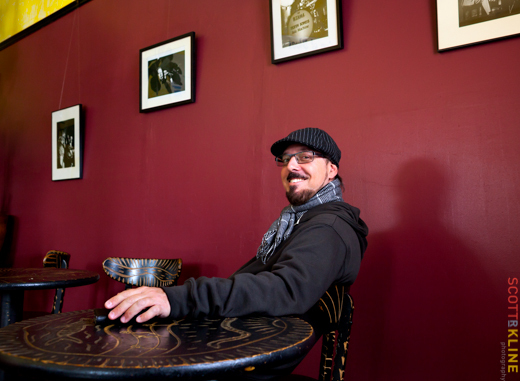 Greg Mindell serves a customer at his pop-up in Dogpatch, San Francisco, CA on February 21, 2013. I grew up in New York and in Florida and I started in the food business when I was 14 years old. My first job was in an Italian deli as a dishwasher and then I worked my way up to other jobs. The baker there was an old Navy guy who had lots of great stories. I learned so much from him and from all the other places I worked where there was always someone who took the time to share what they knew with me. For many years I was an instructor at the San Francisco Baking Institute, among other places, and I heard people describe me as self-taught but really, even though I didn't have a formal culinary school education, I was taught but folks like these. So I have this urge to give back what I've learned to the community -- to create a place where food and stories can be shared. Besides teaching pastry, I also baked for other shops such as Tell Tale Preserve, Spruce and Tartine. I always had a goal to open my own shop. But I want to do it the right way and to me that means having as much start up capital as I can before I open a brick and mortar shop. My current catering and wholesale business in addition to holding pop-ups will help me get the majority of the capital I need. Dogpatch is my first choice for my brick and mortar shop. I like that Dogpatch still feels a bit like uncharted territory still -- there is still a bit of chaos in the neighborhood and I like that. I also really like the mix of people in the neighborhood. My customers are PG&E workers, winemakers, caterers, technology folks, etc. and they all seem to appreciate what I have to offer. And I grew up near the water so I like that Dogpatch is on the waterfront. I rent commercial kitchen space in this building from Jamieson Leadbetter, owner of Leadbetters Bakeshop. When Tell Tale Preserve ended up shutting down, Jamieson reached out to me and offered me his kitchen space. I appreciated his support and admire what he has done with his business. Also, there is a guy, Paul, who is the original founder of International Pastries which is also in the American Industrial Building. Although he sold the company, he still works there and he so reminds me of some of my early teachers. He is a quiet character but has lots of great stories -- when he does speak you know you should listen! When Tell Tale didn't work out, with my wife's blessing and much appreciated support, I took six months off and did a walkabout. I traveled, taught, baked and thought. And running Neighbor is what I want do be doing. 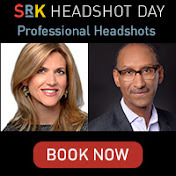 This industry is so inspiring and dynamic that you can really do so many things. If I weren't working on this bakery then I would still be in the food business but probably in some academic way -- perhaps studying anthropology of food or culinary science. And why name your new adventure, Neighbor? While on my walkabout I thought a lot about names. I like that Neighbor means community and about being connected but not in an overly trendy or overly hyped way. The name is inclusive -- it can cross borders and include everyone. 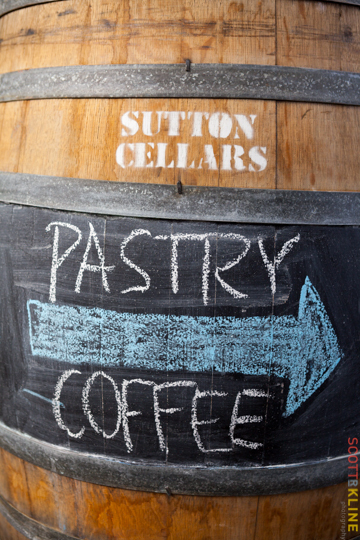 The barrel points the way to Neighbor bakery in Dogpatch, San Francisco, CA. A common sight at the corner of 22nd and Minnesota is the figure of Joshua Shertz, dapper in his ever present cloth cap, pacing back and forth while talking on his cell phone or enjoying the sun with customers and friends at a table in front of his cafe, Cup of Blues. 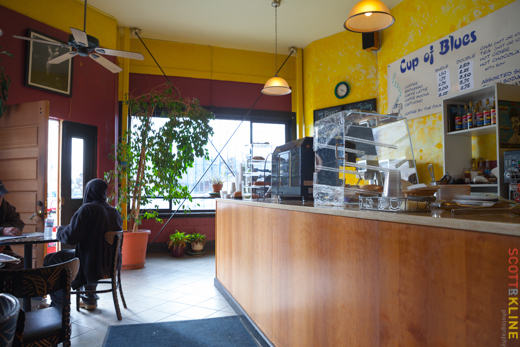 We have often wondered why Cup of Blues serves only coffee and pastries and a few sandwich offerings and closes at 2 pm. And as far as we could tell, there never seemed to be any blues played at all -- at least not the musical kind. It seems like a perfect location for a bustling all day restaurant located as it is on the main merchant street of Dogpatch and within customer sharing distance of Chocolate Lab and Piccino Cafe. Turns out Shertz and a new business partner have been planning and plotting for many months and they are almost ready to close Cup of Blues and transform the cafe into a restaurant offering something for everyone -- whether it be stopping by for a glass of wine or somewhere to go on date night. A steady stream of customers ordered coffee and pastries the day we sat down to talk to Shertz about his plans for the cafe. I love to entertain people and I love food and wine. I started out my professional life in the music business. I'm from New York City but moved to Los Angeles to pursue my music career although I briefly lived in San Francisco for a year before heading to L.A. In L.A. I was a music producer and songwriter for about a decade. I came back to SF when my dad was ill. I decided to stay in SF -- I was pretty much done with the music business. The business had changed from a live act business once MTV started -- I decided I needed a break. The food/wine business is another form of entertainment. I wanted a cafe that initially would be a coffee cafe but could someday be a full service restaurant. I actually signed a lease on a great spot in Berkeley but when I went to complete the paperwork at City Hall, I was told the city was putting a moratorium on cafes! I was lucky that I was able to get out of my lease. A friend drove me around SF and we eventually discovered Dogpatch. I had never heard of this neighborhood but I liked what I saw -- homeowners putting money into their homes by painting them or doing maintenance. And I loved all the Victorian homes. It seemed like a neighborhood on the rise -- and this was in 1994. And of course I liked how sunny the neighborhood was! This site was originally a grocery store for many decades but it was being used as a living space. I signed a lease and fixed it up and we have been here ever since. What I didn't know that due to some issues I had with a former business partner that it would take so long to realize my goal of having a full service restaurant. We are working on a complete redesign of this space with an architect and designer. I can't wait to get the bars off the windows and open this place up! We have our beer and wine license and I'm in discussions with general managers and executive chefs. I want an approachable all day menu that will have items for breakfast, brunch as well as happy hour and late night dining. We will most likely close at the end of March for renovations and reopen in May. And there while we may at some point have live music, it will not be Blues! There are quite a few musicians and film people who live and work in Dogpatch. I've really enjoyed meeting filmmaker David Munro and his wife, the producer Xandra Castleton, of Grotto Films. They are both so creative and David has some great stories. Well the first month I was in business a customer had a medical emergency in here. I thought, "oh great, this is what it is going to be like to deal with the public!" Over the years it has been fun to watch various production companies film in our neighborhood. The TV show, Nash Bridges, starring Don Johnson used to film here all the time. And the first year the Burning Man Decompression event was held on Indiana Street was just bizarre! I would still be doing something in the entertainment world but would probably be managing a band or a club. I love to introduce people to music and artists that they may never have heard of and preferably do that while sipping a great glass of wine.